I can’t quite believe it’s Friday again already! I promised to tell you something today! It’s not a big thing at all really. 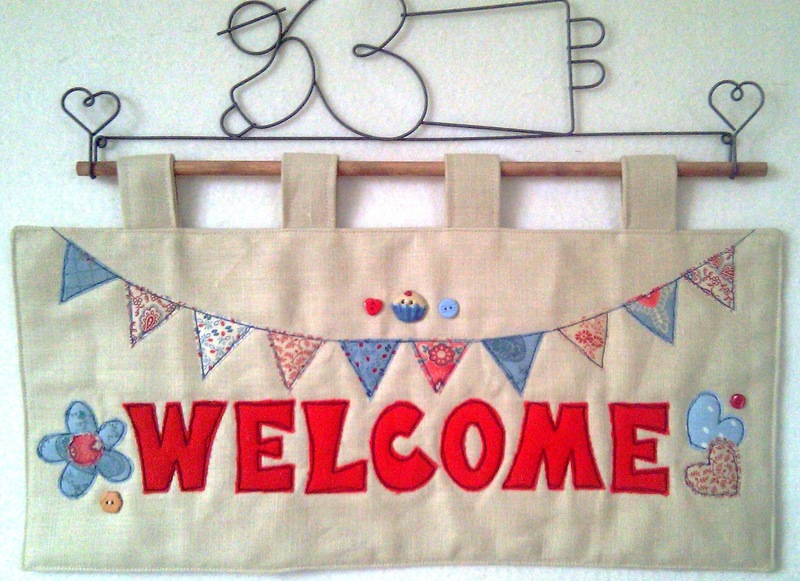 But I’ve entered my Welcome Wallhanging into the Quilting Bloggers Weekly Themed Quilting Contest! This week’s theme is ‘Wallhangings’. I’m not at all expecting to win (there are some truely fabulous wallhangings entered), I just fancied being a part of something fun. If you want to, you can pop on over to QB and vote for your favourites. And if you fancy having a go at making a Welcome Wallhanging yourself, the pattern is available in my Etsy Shop. I am hoping that while I am at work this morning, my orange zips will arrive, and fit through my letter box (please don’t leave me a red card Mr Postie!). I have a busy weekend ahead. Friends coming over tonight for food (don’t panic Susan – it will be take-out! ); breakfast duty in the morning (I meet up once a month at a coffee shop with friends for brekkie), Bee Blessed duty in the afternoon, Family movie night (with ice-cream! ), church on Sunday and somewhere in there, a trip to IKEA to help my daughter get a giant sized frame for her GCSE art work! Anyone got any red bull! Have a brilliant weekend, whatever you get up to! Previous Previous post: Getting Stuck In!